I get so excited when school lets out for the summer! I love having my kids at home with me, doing crafts and traveling. This year, they brought home loads of unused and slightly used school supplies, which made me wonder if there is a better way to use those supplies rather than save them for next school year. Most of the time, they get lost in the shuffle and I end up buying all new supplies again anyway. 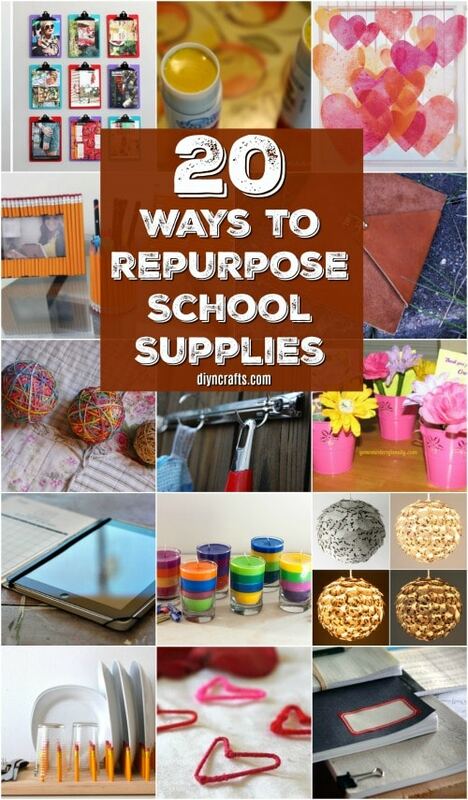 So, I started looking for some creative ways to repurpose those school supplies and maybe give the kids an extra project or two this summer. I found 20 wonderful ideas and I’m so excited to share them with you! You know how much I love to repurpose. Honestly, if there is a new use for something I’m sure to try it rather than just throw that something out. Repurposing has changed my life! Just look at these amazing ways to repurpose empty cereal boxes. If I can find a way to reuse it, that’s what I’ll do! Whether your kids have come home with loads and loads of graded papers, boxes of crayons or any other school supply, I’m going to show you a great way to repurpose them. From pencil jewelry to iPad cases made from composition books and even a great lamp shade that you can make from those old papers, there literally is something that you can make with everything they bring home from school. And if you’re a teacher, you’re really going to love these ideas. You should also definitely check out these 37 parenting hacks that are sure to make your life easier. 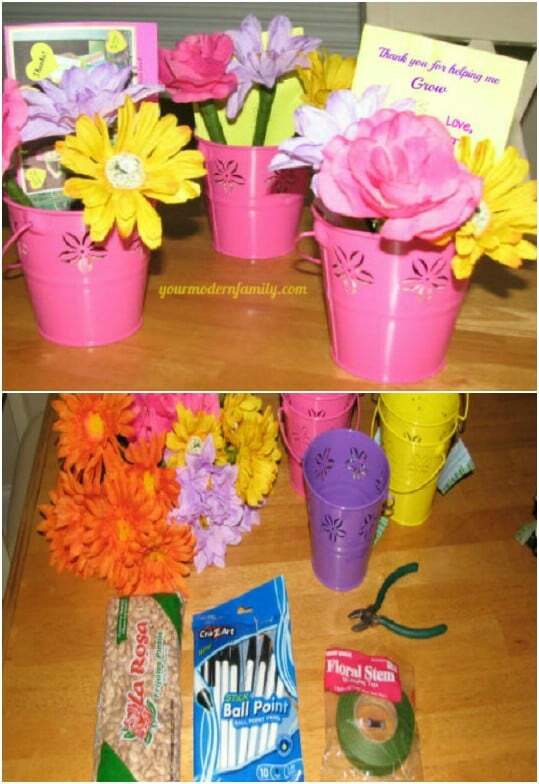 So, if your kids bring home half the school when summer finally gets here, I’ll show you some great ways to repurpose those supplies and turn them into fun summer crafts. I hope you enjoy these projects as much as I have and as always, I hope you’ll share your favorite. 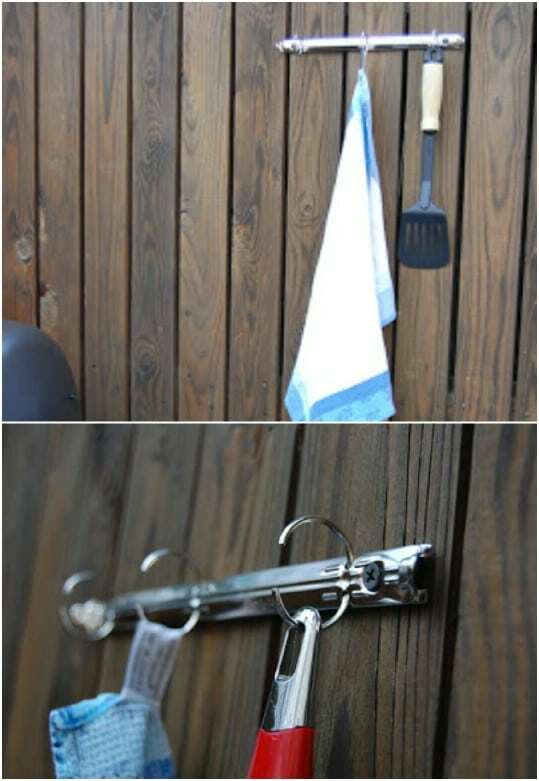 If you have a few old clipboards to repurpose, why not make your very own real life Pinterest board? 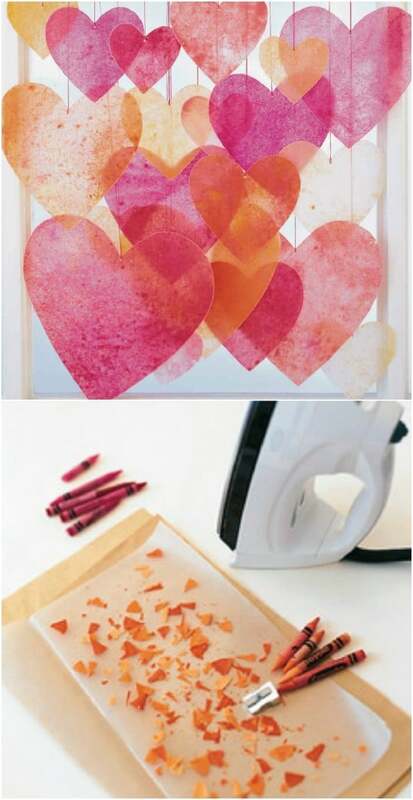 I absolutely love this idea and it’s great for those of you who really love your Pinterest projects. 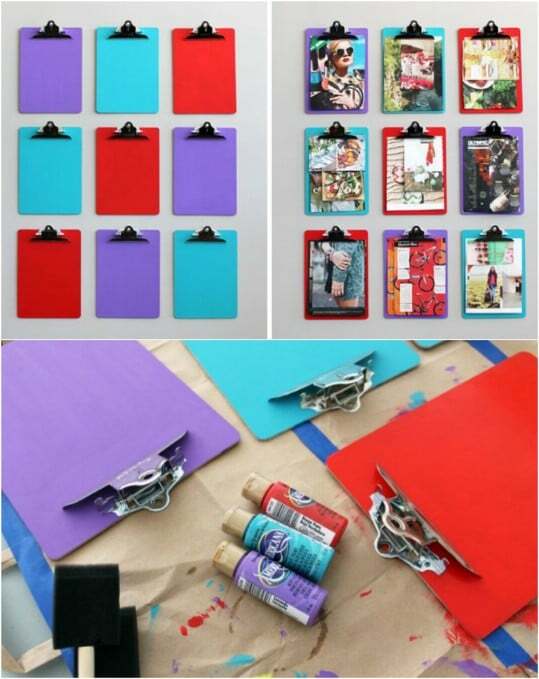 Just paint your clipboards and then choose images that you want to display. This would be a great showcase wall in the living room and it shows everyone that you’re a Pinterest fanatic. Turn that empty – or full – composition book into a great looking iPad cover. You’ll need to remove the pages so if your book isn’t empty, it needs to be. Just turn those empty pages into drawing paper for the kids. This is such a cute idea and it’s pretty simple to do. Plus, it will help to keep your iPad protected. Every parent has broken crayons after the school year. Instead of throwing them out, turn those old crayons into these lovely sun catchers. You’ll need crayons and waxed paper to make these and they make wonderful gifts. Let the kids help you and make heart sun catchers in multiple colors. 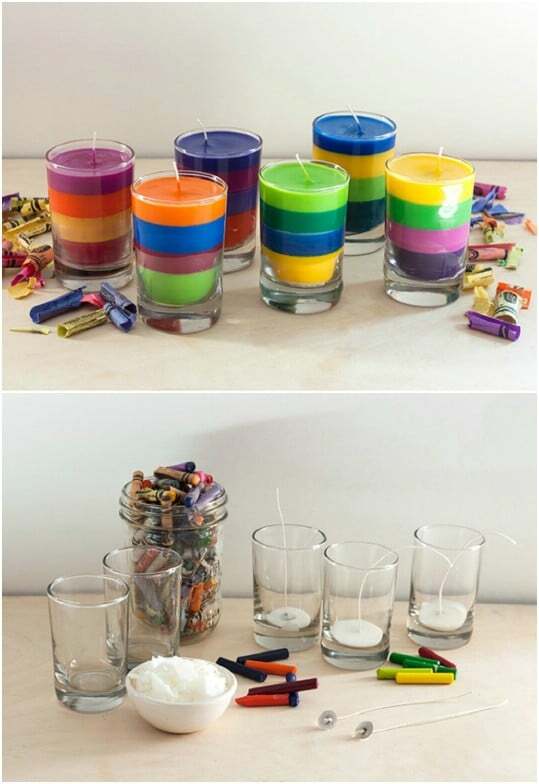 If you’ve never made crayon candles then you are totally missing out. These are so great! They’re easy to make and they’re the perfect way to use up those broken crayons that come home with your little ones this summer. You can make them in whatever colors you have available and even create tiered looks, too. You can even add essential oils to give them a wonderful scent. I love these little flower pens. They make the most wonderful gifts for teachers and if you have a lot of pens leftover at the end of the school year, that’s the perfect time to make a batch. You just glue a silk flower to the end of the pen and then wrap the pen in floral tape so that it looks like a stem. The pens work perfectly still and they’re much more beautiful when you dress them up as flowers. Did you know that you can make paper from paper? That sounds redundant but it’s actually a thing. 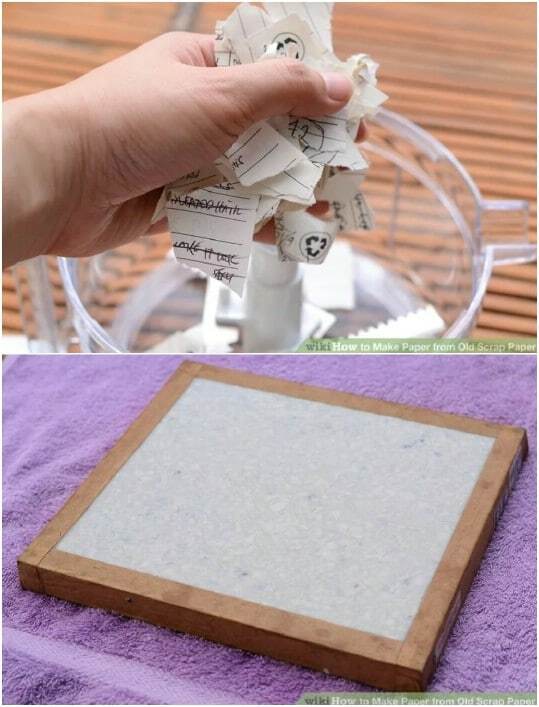 If your kids have tons of graded papers that you’re planning to just throw out, use them instead to make your own recycled paper. This may be a long process but it’s definitely worth it to be able to tell people that you make your own paper. Plus, you could put all that paper into a great journal case and it would make a wonderful gift. 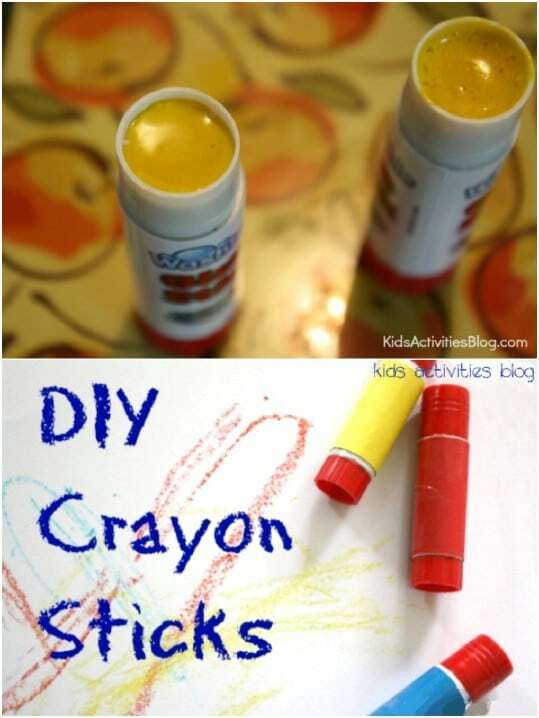 You can turn those empty glue sticks into great crayons for the kids. This also uses up those broken crayons, too. Just clean the glue sticks to remove all the glue, melt your crayons and then pour the liquid into your glue stick containers. Once it hardens, you have great new crayons that they can twist up as needed. Those three ring binders normally don’t make it through the school year and that’s okay because you don’t need the entire binder to make this leather journal. You just need the ring part and that’s usually intact. 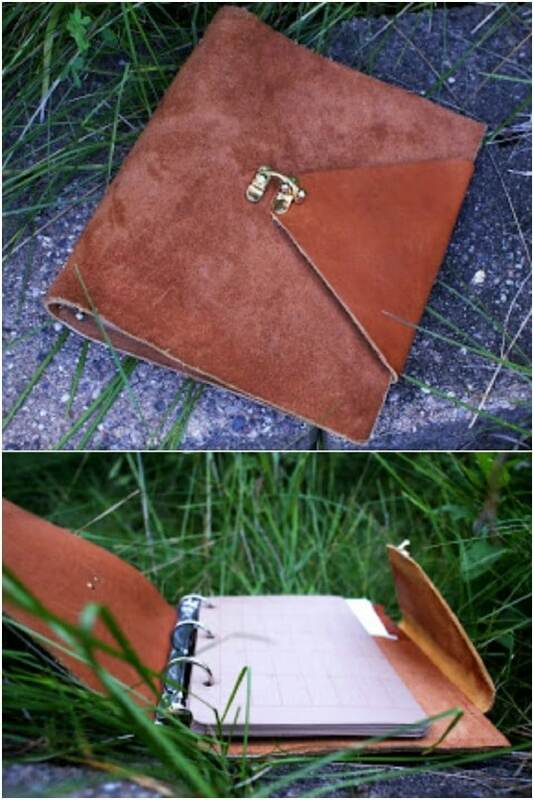 Just take it out of the binder and put it into a square of leather that you cut to the right size. You can then add paper and you’ve got an amazing leather journal or planner from that upcycled binder. 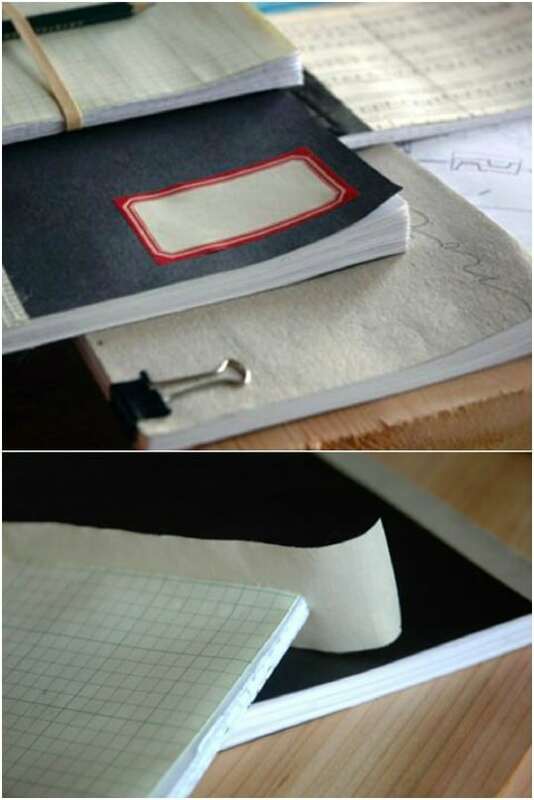 Those old notebooks can be made new again with just a bit of work. This also works really well for loose leaf notebook paper. 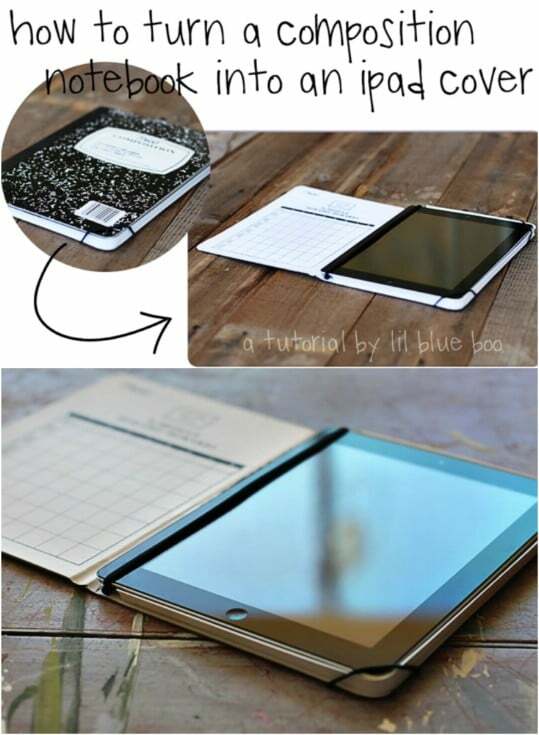 You just create a new notebook cover and add all of that blank paper to it. Now, instead of multiple notebooks with just a page or two that’s empty, you have one perfectly new notebook that you can even add to your school supply stash for next year. 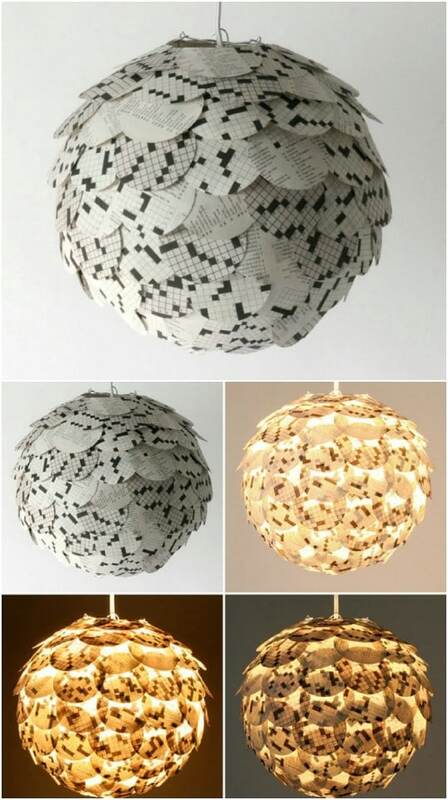 This lamp is so gorgeous and it’s made from upcycled book pages. You know those workbooks that the kids never get finished, yet they’re sent home at the end of the year? Those are perfect for making this artichoke lamp. Or, you could just check out this one that I found on Etsy. It’s made with crossword puzzles but you can find them in so many different publications, and it’s just $85. 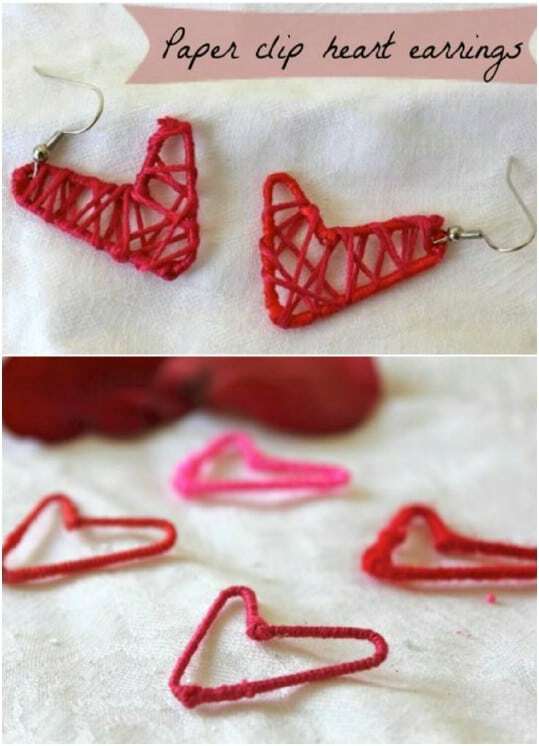 If you have a handful of paperclips leftover from the school year, you can turn them into these amazing heart shaped earrings. You just have to bend the paperclips so that they form a heart shape and then cover them with embroidery floss. They’re so easy and if you already have the paperclips and embroidery floss on hand, they won’t cost anything except for your earring hooks. Kids will adore making their own paper mache and they can do it from those leftover graded school papers and workbooks. This is a great project for younger kids, too. It will keep them busy inside where it’s cool and they can make some pretty amazing things from their paper mache, too. 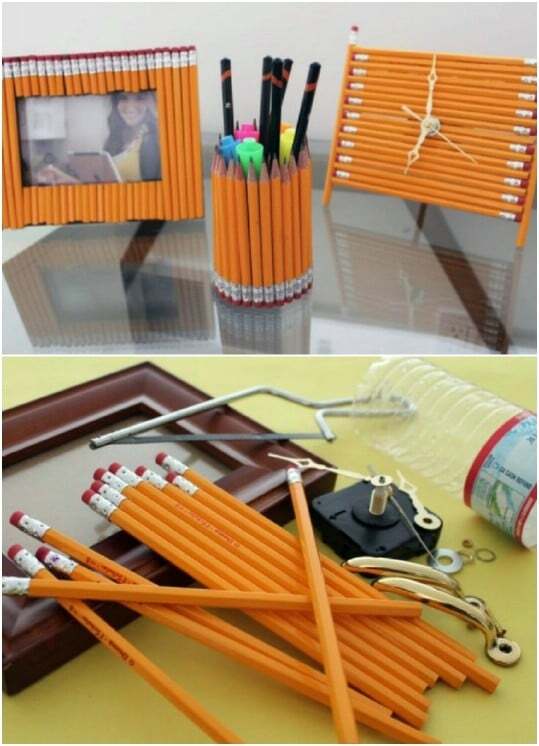 Take those number two pencils and turn them into anything from a clock to a picture frame and so much more for your desk. If you have a pack of pencils, you can create so many things for your desk, including a great pencil holder – that’s made of pencils! I love the idea of turning pencils into desk accessories – it just seems fitting. Those sharpened pencils that aren’t really long enough for other projects can be used to make this great dish rack. This is made by attaching pencils to a wooden cutting board and it is the most unique dish rack I have ever seen. You’ll need to drill holes into the board to add the pencils, but if you have a drill then that’s no problem. Take those broken or otherwise unusable pencils and remove the erasers. The eraser makes the perfect back for your earrings! I’ve used this trick in the past and it really does work well. 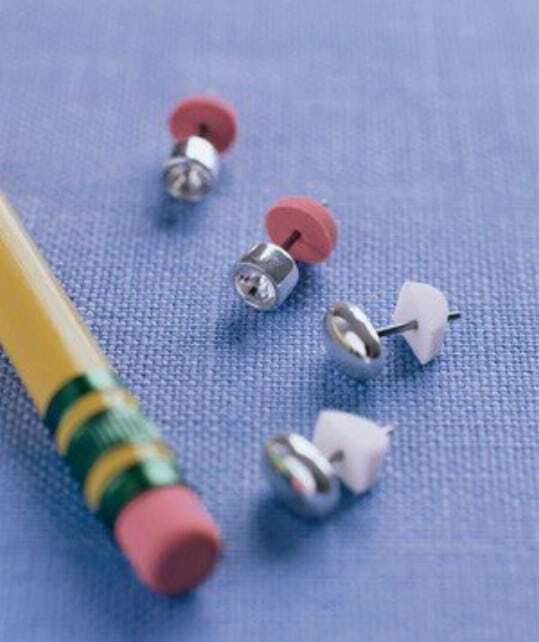 The eraser keeps those earrings snug, too. You won’t have to worry about the back falling off and losing your earring. This is the perfect solution if you’re in a pinch, too. 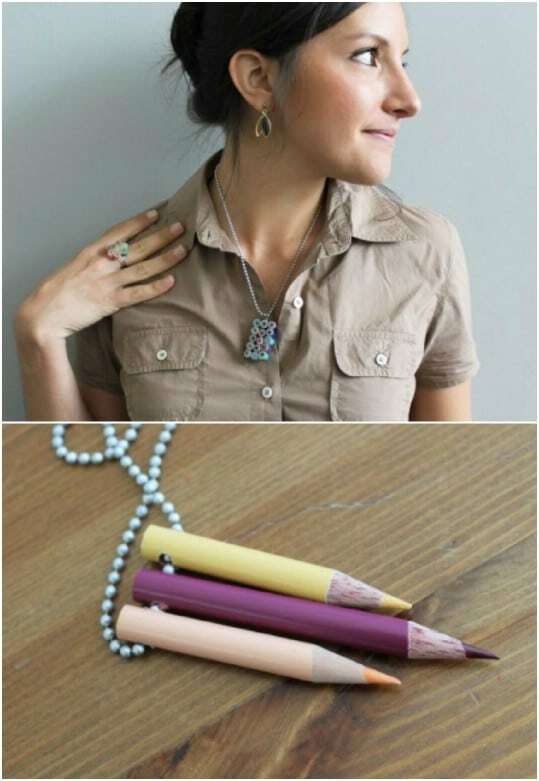 Cut those leftover colored pencils – or the ones that are too short to sharpen any more – and turn them into beautiful jewelry. You’ll need to drill a tiny hole into them to string them up on jewelry wire and when they’re finished, these make the most beautiful jewelry ever. They are colorful and have such a nice rustic look to them. Kids may not have Post Its at the end of the school year, but teachers normally do. I actually keep them on my desk to jot down notes pertaining to the school year. 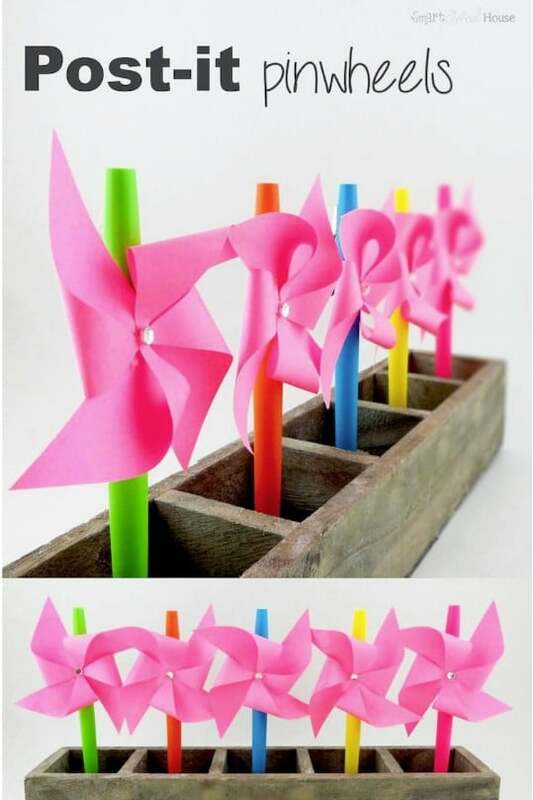 If you have a few Post Its left over after the school year, you can turn them into colorful pinwheels that you can affix to the erasers on your leftover pencils. 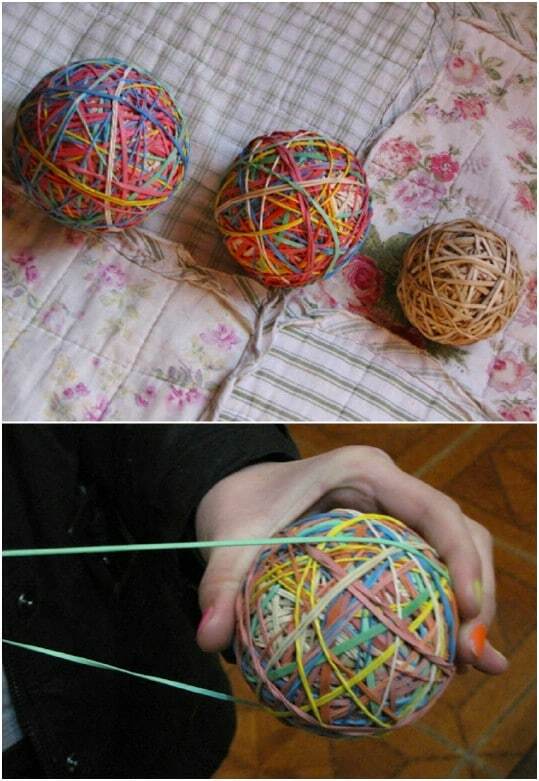 Turn rubber bands that you don’t need any longer into great bouncy balls for the kids. These things really have some bounce to them and kids are going to love playing with them. If your kids bring home loads of rubber bands, you can make loads of bouncy balls and they’ll have a great new toy to keep them busy when it rains or when it’s just too hot to get outside and play. 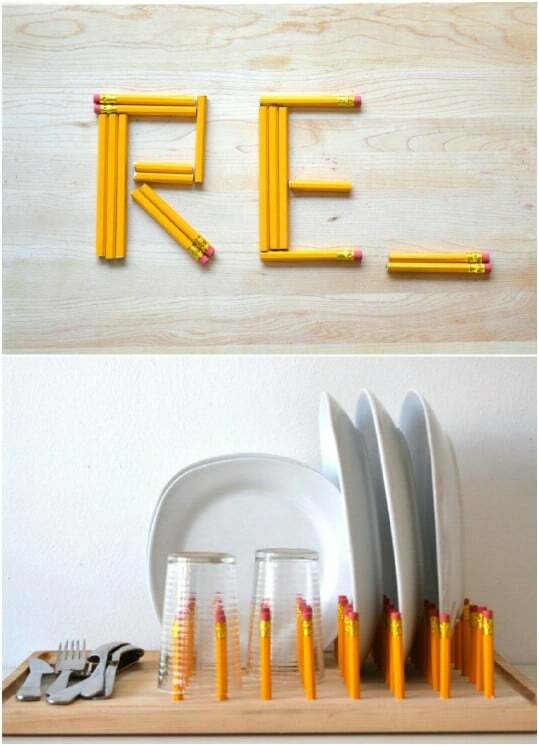 Here’s another great way to use up those colored pencils. 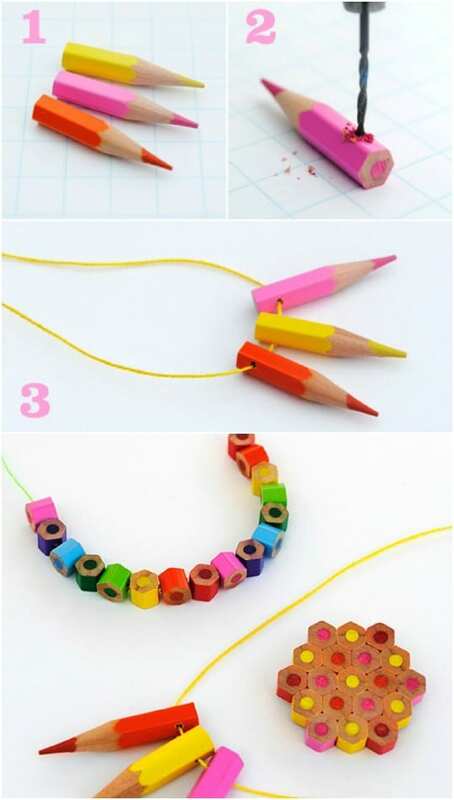 You can turn them into all sorts of colored pencil jewelry and accessories. You don’t even need to cut them. Just drill tiny holes in them and then use them as beads to create any number of beautiful things like necklaces, earrings or even a great belt. Those binder rings can be used for organization! I love a good organization hack and this one is one of my favorites. Just take the ring part off the binder and then use those rings to hang and organize any number of things. Screw it onto the wall and use it to hold kitchen utensils or aprons or you could even hang it in the closet and use it to keep belts or scarves organized.